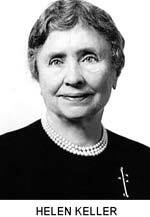 June 27, 2000, is the 120th anniversary of the birth of Helen Keller, and each year the week in which her birthday falls is recognized as Deaf-Blind Awareness Week. 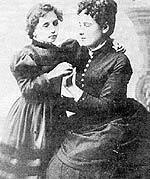 In honor of Helen Keller -- and other members of the deaf-blind community, this week is dedicated to the deaf-blind. Every year the last week of June is devoted to one thing--recognition of the deaf-blind people in our midst. While the purpose of Deaf-Blind Awareness Week is to pay homage to Helen Keller, the deaf-blind woman who was born that week, the week focuses on increasing public awareness and understanding of deaf-blindness. According to the Helen Keller National Center (HKNC), about 70,000 people have hearing and vision loss. More than a decade ago, Deaf-Blind Awareness Week became an event officially recognized by the Federal government. Our eyes and ears provide vital ways of interacting with the world around us. The lilt of laughter, the beat of a brass band, the smile of a friend, and the poetry of a landscape are but a few of the life blessings that our senses of sight and hearing help us to enjoy. But for some 40,000 Americans who can neither see nor hear, the world can be a prison of darkness and silence. Inadequate education, training, and rehabilitation for those who are deaf and blind may prevent these Americans from becoming independent and self-sufficient, thereby greatly limiting their life potential and imposing a high economic and social cost on the Nation. We must prevent such problems among our deaf-blind citizens by fostering their independence, creating employment opportunities, and encouraging their contributions to our society. Crucial to fulfilling this urgent national need is research on the disorders that cause deafness and blindness. Toward this end, the National Institute of Neurological and Communicative Disorders and Stroke and the National Eye Institute as well as a number of voluntary health agencies are supporting a wide range of investigative projects that one day may provide the clues to curing and preventing these devastating disorders. On June 27 we commemorate the 104th anniversary of the birth of Helen Keller, America's most renowned and respected deaf-blind person. Her accomplishments serve as a beacon of courage and hope for our Nation, symbolizing what deaf-blind people can achieve. Now, Therefore, I, Ronald Reagan, President of the United States of America, do hereby proclaim the week beginning June 24, 1984, as Helen Keller Deaf-Blind Awareness Week. I call upon all government agencies, health organizations, communications media, and people of the United States to observe this week with appropriate ceremonies and activities. In Witness Whereof, I have hereunto set my hand this twenty-second day of June, in the year of our Lord nineteen hundred and eighty-four, and of the Independence of the United States of America the two hundred and eighth.